NOTE: Clicking on the Bulbmeister.COM logo in the upper left-hand corner will return you to the Bulbmeister.COM Flower Bulb Shop. From the family, Amaryllidaceae, having common name(s) associated with the genus; Rain Lily, Zephyr Lily, Fairy Lily. 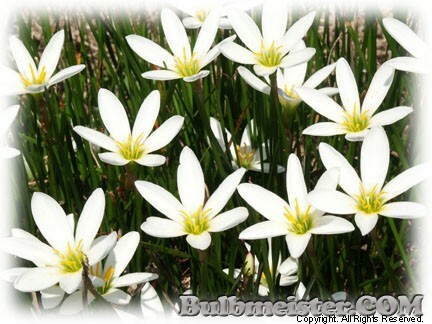 These are great bulbs to have in the southern landscape. They are a unique rain lily in that they are very happy as a bog plant. In late summer they throw up solitary white blooms just a couple of days after much needed rain. Best experienced in groupings. Ht. 8-10 inches. Hardy in zones (6), 7, 8, 9, 10. Return 10 25 50 Results per Page.